Excelitas Technologies® Corp., a global technology leader focused on delivering innovative, customized photonic solutions, today introduced its X-Cite® XYLIS light source for fluorescence microscopy. The new X-Cite XYLIS includes Excelitas’ patented LaserLED Hybrid Drive® and offers a rich, broad spectrum output from 360-750 nm for exciting an extended range of fluorophores, with the advantages and simplicity of using LEDs. X-Cite XYLIS provides enhanced LED coverage from one end of the light spectrum to the other, closely matching the output of a mercury arc lamp while eliminating any need for bulb replacement. With a 365 nm spectral peak, X-Cite XYLIS fits perfectly with the narrow DAPI filter sets that are standard in research microscopes. At the opposite end of the spectrum, X-Cite XYLIS provides 735 nm excitation for Cy7, a wavelength that is not available in any other broadband LED light source at comparable prices. 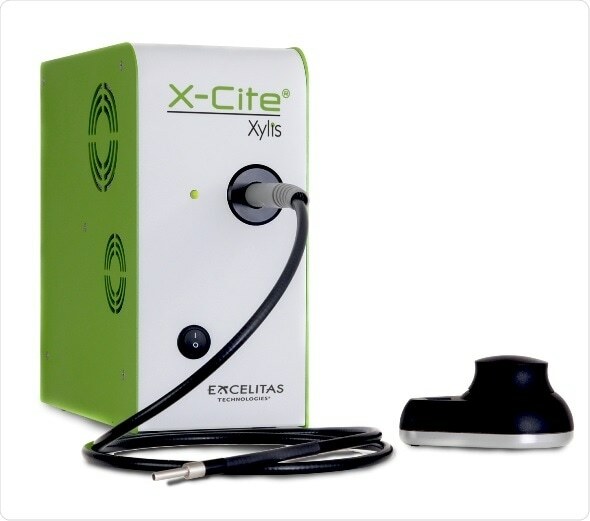 The X-Cite XYLIS is the latest addition to Excelitas’ popular X-Cite product line. Incorporating Excelitas’ patented LaserLED Hybrid Drive technology, X-Cite XYLIS enables researchers to overcome the LED green gap – the 540 nm to 590 nm region of the spectrum where LED-only systems are significantly challenged. This novel technology developed by Excelitas utilizes high-efficiency lasers to excite a phosphor layer, generating a broad peak from 500 nm to 600 nm which can then be filtered to a more specific excitation band depending on the fluorophore of interest. The award-winning LaserLED Hybrid Drive is also more efficient and provides higher output than other technologies, such as luminescent rod technology, and allows the X-Cite XYLIS to be a quieter system than its predecessor, X-Cite Fire. X-Cite XYLIS power levels for TRITC, Cy5 and Cy7 excitation are equivalent to the power of arc lamps. It is suitable for a wide range of uses from routine imaging to demanding high-speed applications. Designed for use with liquid light guides, X-Cite XYLIS is compatible with modern light-guide-only microscope designs and can also be combined with X-Cite microscope adaptors to replace traditional lamp houses. X-Cite XYLIS makes it possible to switch from mercury lamps to environmentally-friendly LEDs without compromising on price or performance. X-Cite XYLIS offers the same intuitive, easy manual operation as other X-Cite products, with speedDIAL or foot pedal, USB and TTL control options. It is compatible with the standard X-Cite command set for seamless integration with existing X-Cite 120LED software drivers. The new X-Cite XYLIS will be displayed for the first time at Experimental Biology 2018 Excelitas Booth # 1008, April 22 – 24, 2018 in San Diego, CA.